A letter from a Step-Mom. 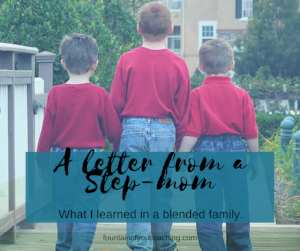 What I learned in a blended family. I have no idea how we got here. I remember a time when we were kind and even friendly to each other. When we met, we had great plans and ideas about the positive impact we would have on your children and mine. We were going to show them how two moms could come together in the name of love and family to raise our boys together. We would show them what a good wife and mother looked like so they would seek that out for their own family. We had coffee and supported each other, we developed a friendship (not best friends, but friends nonetheless). We joined together for parent-teacher conferences, award ceremonies and school plays. Overtime it became clear that you and I were co-parenting over the head of my husband. I found that, while I had good intentions to help unite our families from the fighting and bickering between you two, I was becoming a pawn. A way for you to manipulate the father of your children. There is a term for this, triangulation, pinning one person against another. My failure was that I did not recognize that I was cheating my husband out of the co-parenting experience. Sometimes these relationships take on struggle and morph into something we never expected. The real trouble began when I recognized this and made changes to adjust. I noticed that your husband never got involved in these issues. So I took a page out of his playbook and stepped out of the role I was playing. Surly now that time had passed you two could step up and work together. Sure it would be uncomfortable for a bit while you got your footing. What happens after that would be a different story from each side all together. Where you mad and making us pay for that? Did you think we did not care about the kids because the way we show love and support differs from you? Did you have a hand in swaying their “loyalty”? Did we get so tired of the toxicity and attitude we felt from you that we avoided just so the kids wouldn’t feel uncomfortable? That part of the story becomes a “he said, she said” and is not helpful anyway. Regardless of how angry or sad I may feel over the way things turned out, thank you. Yes, thank you. Thank you for teaching me what kind of co-parent I want to be with my kid’s father and his new family. Thank you for keeping me focused on making the “hard on the heart” choices when I want to put my arms around my child so tight I forget to let others love and benefit him. Thank you for keeping me back from judgment when my ex parents our child differently than I. Thank you for keeping me in my place, as one of many who love and support my child. Not the end all be all only on to influence him. Because of this experience I have a more smooth co-parent relationship with my ex. I respect his wife and the family that they have build together. I have no endless court dates for modifications and custody fights, paperwork and a third part telling us what do do with our family. We have build our own agreement and we change it as needed without permission from outsiders. You may not have intended to, and it may be at a very high price, but you taught me how to be a biological mom in a blended family. One who knows God put so many different people in my child’s life for a purpose and one who respects those relationships and allows them to grow outside of myself.